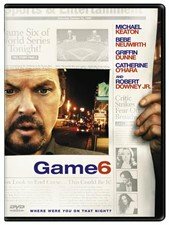 Michael Keaton stars in this literate comedy/drama, portraying a playwright whose latest work is opening on a fateful day--the same day as the legendary sixth game of the 1986 World Series between the Boston Red Sox and the New York Mets. As a die-hard Red Sox fan, Keaton can't help but believe the success or failure of his play rides on the fortunes of his favorite team. Robert Downey, Jr., Griffin Dunne, and Bebe Neuwirth also star. 87 min. Standard; Soundtracks: English Dolby Digital 5.1, Dolby Digital stereo; Subtitles: English, Spanish; behind-the-scenes footage; interviews; theatrical trailer.